Welcome! A theme of my over 30 years of service on the Board of Aldermen has been to help preserve and enhance our community and to help solve problems for constituents. I invite you to call me at home at 617-566-3848, e-mail me at AldermanBaker@comcast.net, or write to me at Newton City Hall, 1000 Commonwealth Ave., Newton, MA 02459. In the meantime, I also invite you to learn more about the Board of Aldermen and how I might be helpful to you, as I have other citizens for three decades as the Ward Alderman for Ward Seven. (Ward Seven is roughly the area of Newton east of Centre Street south of Church Street, east of Grant Avenue, and east of Glen Avenue). I also want to express my gratitude for the opportunity to continue to serve you and other citizens again as an alderman next term. Again, please visit, call or e-mail me if you have any questions or suggestions, or would like to discuss a problem where I might be of help to you. Thank you. 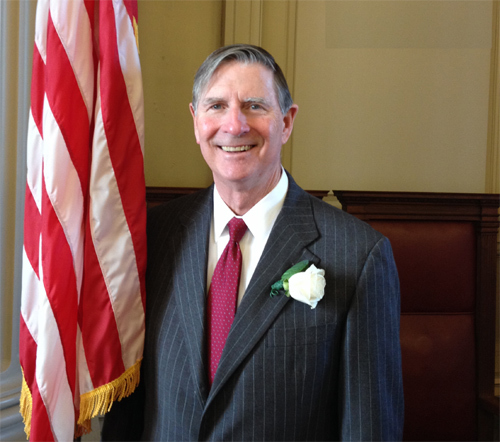 Lisle at his inauguration New Year's Day, 2014, when he began his 16th term as the Ward Alderman for Ward Seven, and was elected President Emeritus for the 2014-15 Board of Aldermen by his colleagues. To help you get in touch with me and key Newton agencies, here is web and telephone contact information for them. You can download the list in PDF format (approx. 123 kb), or view it in a printer-friendly page.